The Metropolitan Detroit is a prestigious cultural publication in Detroit that is published monthly ever since the year 2009. The Metropolitan Detroit is famous for informing and entertaining its readers about all things to do with Detroit. It allows the travelers to enjoy a better experience, champions the local businesses and artisans, promotes the community and features the Michigan lifestyle and the Detroit culture. The Metropolitan Detroit boasts of a wide distribution area. It can be found in more than 80 stands, 25 area hotels, 100 locations in the Metropolitan area and 5 locations in the Traverse City area. 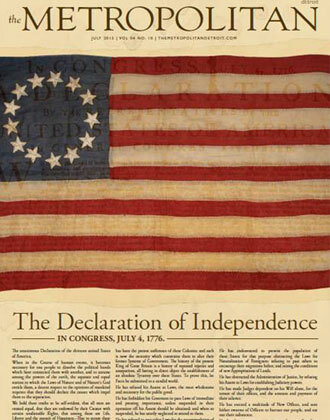 The Metropolitan Detroit readership consists of national and international travelers, Michigan natives and Metro Detroiters. 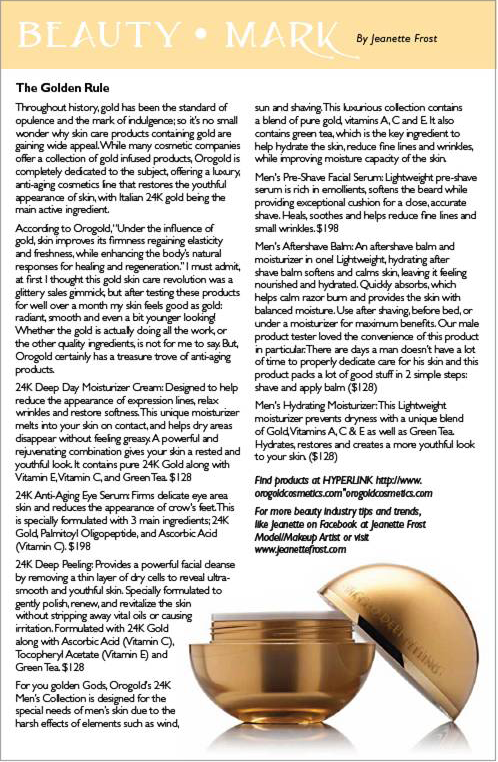 In an article titled “The Golden Rule” that appeared in the Beauty Mark Column in the July 2013 issue, author Jeanette Frost talks about the importance of gold in the world of skin care showcasing the OROGOLD line, a skin care brand that uses gold as its signature ingredient. Jeanette is a professional makeup artist and model who is in charge of the Beauty Mark column of the Metropolitan Detroit. This exciting column offers readers with some of the best pro tips, beauty advice and product reviews from the world of beauty and cosmetics. 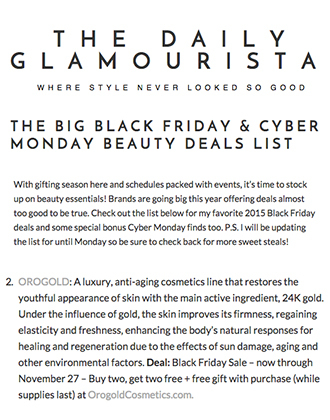 The article talks about how OROGOLD is different from other gold based skin care brands. 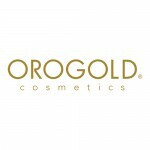 “While many cosmetic companies offer a collection of gold infused products, OROGOLD is completely dedicated to the subject, offering a luxury anti-aging cosmetics line that restores the youthful appearance of skin, with Italian 24K gold being the main ingredient”. Jeanette describes her own experience with OROGOLD products in this article. “I must admit, at first I thought this gold skin care revolution was a glittery sales gimmick, but after testing these products for well over a month my skin feels as good as gold: radiant, smooth and even a bit younger looking”. 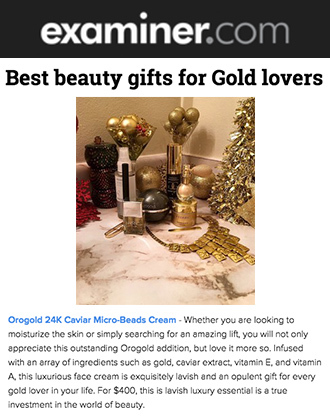 The author features certain products offered by ORO GOLD Cosmetics such as the 24K Deep Day Moisturizer Cream, 24K Anti-Aging Eye Serum, 24K Deep Peeling and the 24K Men’s Collection and offers a beautiful overview for each product as well. 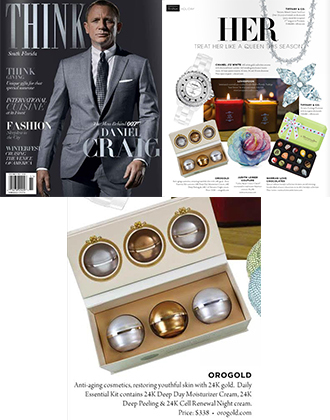 We are thankful to Jeanette for taking the time out to review our products in great details and to The Metropolitan for featuring this beautiful article in its esteemed publication.